British-trained Afghan National Police (ANP) in Helmand province are becoming increasingly independent and professional, according to senior UK military and civilian officials speaking in London. 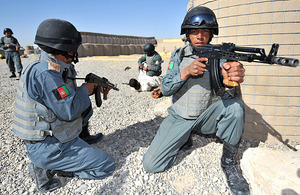 In a press conference at the MOD in Whitehall yesterday, Major General John Lorimer, the MOD’s official spokesman on Afghanistan, said that ISAF and the Afghan Government were ahead of target in terms of the numbers of ANP being trained, though he reiterated that, while quantity is important, quality remains imperative. Police numbers across the country stand at around 116,000, ahead of the current target of 112,000, including 7,000 in Helmand, with a further target to reach of 134,000 by October. One of the key drivers behind that increase - and the growing ability of the force - is the Helmand Police Training Centre (HPTC) in the provincial capital, Lashkar Gah. Lieutenant Colonel Adam Griffiths, Commanding Officer of 5 SCOTS and of the Police Development Advisory Training Team (PDATT) in Helmand, said that the AUP (Afghan Uniformed Police, as opposed to the Afghan National Civil Order Police or Afghan Border Police) are progressing quickly, both on deployed joint operations with the Afghan National Army, and on more routine policing issues. Lt Col Griffiths stressed that the process of recruiting, selecting and training existing and new recruits is wholly Afghan owned and co-ordinated. It is of note that over the past four months potential patrolmen failing the initial drugs test has fallen from eight to 10 per cent to less than two per cent - and indeed on the most recent course enrolment there were no failures,” Lt Col Griffiths said. In many case the potential patrolman comes from a mostly sealed rural community and as such they have little education and no understanding of Helmand - let alone Afghanistan,” he explained. Therefore, the Ministry of Interior delivers cultural and literacy lessons that play an enormous part in the development of the confidence and social standing of the young men when they complete their training. Indeed, just prior to the last passing out parade, where we passed out the 2,000th trainee through the Helmand Police Training Centre, I listened to one of the more experienced Ministry of Interior instructors tell his young recruits that they possessed the same social standing that he does back in their communities because they can now read and write. Therefore the opportunity afforded to these young men in joining the ANP cannot be underestimated. We’re in a much better place than this time last year, but a lot still remains to be done. He said retaining ANP recruits was a ‘big issue’ 12 months ago because of several factors including casualties, poor pay, lack of discipline and weak leadership. However, initiatives such as monitored ‘pay parades’ where patrolmen are required to present all their equipment before payment is handed over and the increased use of bank accounts to reduce confiscation of pay by senior officers have led to better retention rates. General Angar, the provincial chief of police, now sends teams to inspect the district police to ensure his patrolmen are at their posts, are correctly turned out and equipped. In short they are driving professionalism and accountability and, although seemingly small steps in the development of policing, they are giant steps in enhancing the perception of the ANP internally and more importantly in the eyes of local nationals. Mindful of past incidents when ANP members have turned their weapons on their ISAF and Afghan colleagues it was also stressed that a complete screening programme of potential recruits is undertaken. This involves biometric testing which, over the last four months, has resulted in only two people being rejected, both, said Lt Col Griffiths, because they had criminal records.